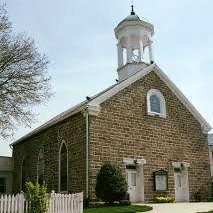 St. John’s Reformed (United Church of Christ) Church was constructed by 1822 with the cornerstone having been laid in 1802 which links it to an early period in Woodsboro’s history. The congregation of St. John’s Church was initially a joint congregation of Lutheran and Reformed. The building for this congregation was completed in 1822 and then rebuilt in 1940 for $1200. In 1860, the church divided and became exclusively Reformed. After being struck by lightning, the building was altered again in 1889. A new addition was constructed to the rear of the building in 1957. In the first half of the twentieth century, religious politics dictated that the German Reformed Church merge with the Evangelical Church to become the Evangelical and Reformed Church. Following that change, the Evangelical and Reformed Church joined the Congregational Church of America in forming the United Church of Christ. Today, St. John’s Reformed Church houses the congregation of the Woodsboro United Church of Christ. This church thrives today to serve both its congregation and local community.